Stavanger2018 was an art project in the public space of Stavanger, launched 15 September 2005 by the artist Trond Hugo Haugen. The aim was to discussed long-term effects and future opportunities for the region of Stavanger after the year as the European Capital of Culture in 2008 through art, debate, dialogue, happenings, parties and campaigns. This is the case: Stavanger is the European Capital of Culture in 2008, along with Liverpool (UK), a culture party that last until 31 December 2008. It is Norway’s largest cultural arrangement with a budget of 300 mil. Nkr (c. 38 mil. Euro) and shall provide spectacular experiences and entertainments of a high international quality. There will be fireworks and parties throughout the year from 12 January 2008. But, 355 days later, it’s all over. Stavanger is the fourth largest city in Norway, with 110,000 residents, and has been the country’s centre for the oil industry since the 1970s. On the 15 September 2005 the artist Trond Hugo Haugen launched the project Stavanger2018, an initiative to draw attention to the need for an infrastructure to support the visual arts in the region. In the end the project had grown to include many other cultural categories within the website www.stavanger2018.no and the campaign KA DÅ ITTEPÅ (What About Afterwards). The aim of Stavanger2018 was only to focus upon what shall happen after the European Capital of Culture year. The project was a wholly independent body to Stavanger2008 and was not a protest to the European Capital of Culture event. The first phase (2005/2006) of the Stavanger2018 project drew attention to constructive ideas and healthy criticism via the website www.stavanger2018.no, as well as entering a dialogue with Stavanger City Council about long term strategy and planning for after 2008. 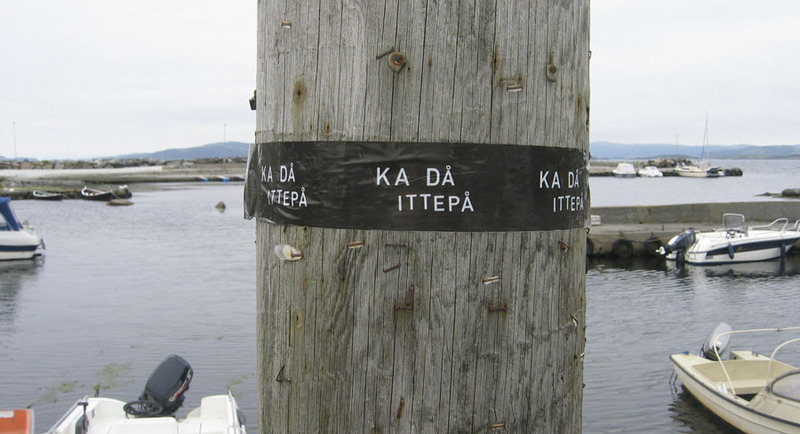 The second phase (2007) involved launching the debate on the streets using t-shirts and stickers; these presented a simple query KA DÅ ITTEPÅ (What happens afterwards). This was followed by a two month program of events focused upon open debate at several prestigious arenas. The third phase (2008) involved a blog in the city’s largest newspaper, Stavanger Aftenblad, and an independant critic. During 2008, Stavanger2018 achieved in excess of 100 articles in the media about the project itself, and, articles including the query KA DÅ ITTEPÅ. The fourth phase (2009) began with a big opening party for all the years to come – Åpning av Ittepåland (The opening of the land afterwards) - at Tou Scene on 31 January; exactly one year after the opening ceremony of the Stavanger2008 year of culture. Over 350 people from the culture scene gathered together to talk about the years to come, to see project presentations, to debate and experience the handing out of six borgerbevis (proof of afterwards citizenship) to representatives of leading institutions; the city mayor, newspaper chief editor, managing director and so on. During 2009, Trond Hugo Haugen organized various meetings, continued his as a independant critic and was a member of Kulturfondet (Stavanger City’s Culture Fond). This is a committee (3 national and 2 regional members) that will distribute 18 million NOK during 3 years, each distribution follows an open application process. In September 2010 Trond Hugo Haugen and his project was elected as the fourth most powerful person in the region’s culture scene. The poll was carried out by the newspaper Stavanger Aftenblad. Haugen was preceded by two full time politicians (the mayor and the chairman of Department of Cultural Affairs), and, the director of the Department of Cultural Affairs at Stavanger City Council. The fifth and last phase (2011) was the program DETTE ER ITTEPÅ ITTEPÅ (This is after afterwards) in connection med the local election. This was the first election after the European Capital of Culture-years. Stavanger elected a new mayor after sixteen years. Indeed, this new mayor will be in charge of the real ITTEPÅ (AFTERWARDS). The centre of Stavanger2018 activities was the website www.stavanger2018.no where interviews, texts and news items was published during the years 2005-2011. All the material was aimed at Norwegian audience and had a welcoming and ironically humoristic tone about the serious content. One of the most important aims of the website was to promote a constructive discussion about cultural sustainability, and, to raise the contents up to a national level. There was a wide criticism and healthy scepticism to 2008 as a year of culture, but this was not been visible to the whole of Norway. The need for long term results remains local, despite the fact that Stavanger2008 has national status. Stavanger2018 had ambitions to raise awareness to a national level via its website and local & national media attention. With the aim of focussing attention upon long term solutions Stavanger2018 started the campaign KA DÅ ITTEPÅ (What about afterwards). These three simple words are marketed through 800 free t-shirts and 7000 stickers throughout the region. The marketing has been dramatically successful: Today the saying (in local Stavanger dialect) has become almost synonymous to the project, and, the years after 2008. The campaign was built up to a series of KA DÅ ITTEPÅ arrangements between 1 August to 30 September in Stavanger. The aim of the program was to hold debates, lectures and workshops upon the theme. A total of 14 arrangements were held, amongst these Phil Wood from the English Comedia Consultancy Team was invited to the region for a 3 day residency that concluded with a lecture upon Creative Cities & Stavanger. There were also held 5 arrangements under the title KA DÅ SOFA; Politicians alongside representatives from the local culture sector were invited to meet for informal public conversations seated on a leather sofa. The program concluded on 29 September with a beautiful party that included cocktails, music, Ka Då Ittepå archive presentation & an art installation – all with a high celebration factor. The main aim was, and continues to be, to increase awareness and attention regarding the years after 2008. It has been successful. In an interview in a local paper, strategy director of Stavanger2008 Rolf Norås described Stavanger2018 as “Stavanger2008’s most important external alliance”.